I’m in week 6 of my half marathon training for the Healdsburg Half in October. I started over with this training since I didn’t keep my mileage up in the summer. I am running a little faster and am able to keep it up for longer periods of time. I think running all summer in the heat definitely helped that. I am LOVING these cooler temps! Allyson has been running with me again, she took the summer off. There are a few races coming up she wants to participate in and of course she wants my retired Nike’s. I went to Luke’s Locker and got fitted for running shoes for the 1st time. And it turns out I’ve been running in the wrong or just not the best shoes for me. 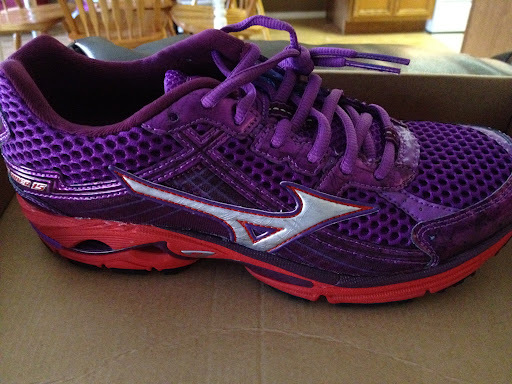 So, I am currently trying out a brand new pair of bright purple Mizuno’s! I have made new friends! Why do you run? Feel free to leave your comments below! This entry was posted in Uncategorized and tagged mizuno, run, shoes. Bookmark the permalink.